SRT elements are excellent for rapidly stabilizing steep to shallow slopes and creating more useable space for developments or structures. Patented Plate Pile™ technology provides slope stabilization using a collection of rigid steel piles that are driven vertically or near vertically into the affected slope in a staggered arrangement of equally spaced rows so that the soil upslope of the pile can fully bear on the pile through soil arching. Plate Pile technology increases the stability of shallow landslides by installing rigid elements that incrementally reinforce the soil embankment. Each plate pile engages a prism of slope soil and transfers the load through the rigid element to the stable soil mass below to which it is affixed at its base for resistance through bending. The system does not require a hard face like soil nails, and can be naturalized following installation. SRT elements are excellent for rapidly stabilizing steep to shallow slopes, and for creating more useable space for developments or structures. Additionally, they are extremely effective in stabilizing landslides of varying degrees up to 1H:1V and slide depths up to 6 meters (20 feet). Read More > > SRTs are excellent for use on sites that have complex access issues or that require minimal environmental disturbance. By utilizing the SRT system, time-consuming and expensive earth moving and excavation can be avoided. In addition, the SRT system is minimally invasive to the environment and is considered the cleanest and fastest method for creating slope stability. The Geopier SRT system is installed by driving Plate Pile elements using small, tracked excavators with a hydraulic hammer or vibratory hammer that can be quickly installed into a competent layer of soil. 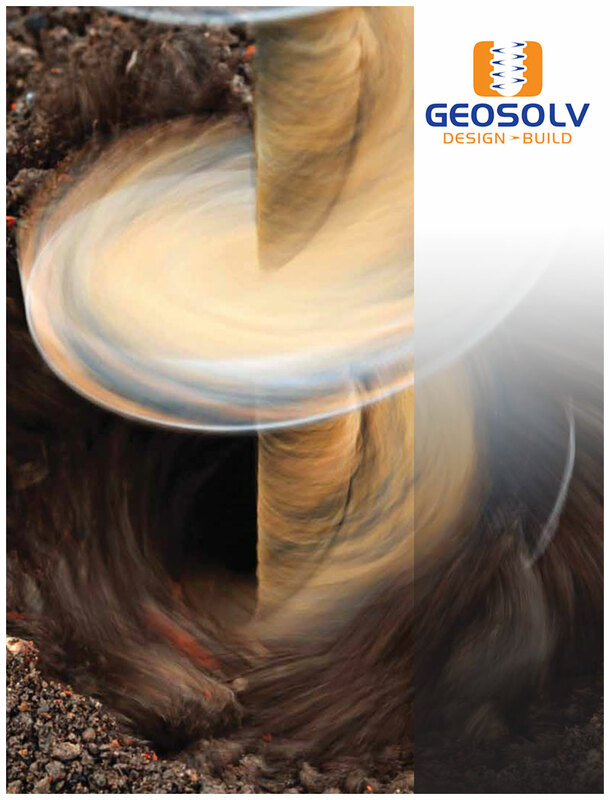 This system is ideally suited to stabilize slopes where the soil conditions consist of an upper shallow zone of weathered, loose, soft or disturbed soil over a stronger layer of soil below.GeoSolv’s slope stability systems are environmentally unobtrusive, cost-effective and have the added benefit of rapid installation. Installation Methodology: The Geopier SRT system is installed using beam section and welded plate, driven vertically through a slide plane using a special impact hammer Read More >> and driving shoe mounted on a small-to-mid-size excavator. The plate piles are rapidly installed in an alternating step pattern up the slope, where each plate pile engages a prism of soil through arching. The pile ends are driven to fixity, and the group of piles improves the factor of safety for slope stability for new or failing slopes. SRT can rapidly treat slides up to 6-7m depths up to 1H:1V for many soil types. The equipment provides for easy access and versatility as well as a cost-effective way to improve failing slides or slopes identified as having low safety factors.